The spread of mold throughout a building or home can happen extremely quickly. If there is an appearance of a water source, such as a plumbing leak, mold can begin to grow and develop within 72 hours. The problems with mold is that it can pose serious health risks to you and your family, and damage the property, lessening the value of your home. 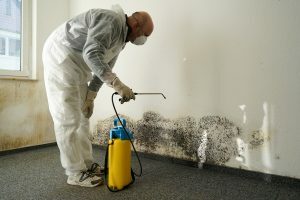 The need for mold remediation is crucial in order to feel safe, and is highly recommended in areas of Maryland where high humidity and heavy rainfall occur during the spring and summer months. Owings Mills, the small suburb outside of Baltimore, experiences such weather changes. As one of the most desirable areas to live in the country, Owings Mills is home to several shopping centers and office buildings, including the Baltimore Ravens team headquarters facility. With so many buildings in such a small area, along with the humid conditions, the spread and growth of mold happens frequently. Therefore, the need for mold remediation in Owings Mills homes is absolutely necessary. If you notice any growth around areas of your home, you should contact a mold remediation expert right away. Mold is detectable by smell and signs of water damage on walls and ceilings. It is known to grow in places that are invisible to the human eye, such as behind wallpaper, paneling, inside ceiling tiles, or on the underside of carpets. Piping found inside your walls are also prime candidates for mold growth if they have leaking problems. What Does The Mold Remediation Process Entail? When an expert comes to do mold remediation in Owings Mills homes, they will make sure to fully eradicate the mold present inside your home. They will repair the water problem, eliminating the source of moisture that allows the mold spores to grow and thrive. The next step for mold remediation in Owings Mills homes is to isolate the contaminated area. By sealing off the area where mold is present, an expert will make sure that the spores won’t spread to other areas of the home, allowing him/her to focus on the one area that’s affected. They can do this by sealing any doors or vents that are in the affected area. Lastly, performing mold remediation in Owings Mills homes requires removing, cleaning, and drying any moldy items. Then the mold remediation contractors will replace and repair any decayed materials. If you notice any signs of mold within your home, don’t hesitate to call for mold remediation. Our experts know the ins and out about mold remediation in Owings Mills homes, and will know exactly how to proceed. In order to prevent the re-emergence of mold within your home, an expert will identify any potential sources of moisture and will let you know how to make sure that moisture and mold never reappear in your home again.